Easily fits where you need it most! Watch the 6-Yard Dumpster in action! During home projects, the 6-yard container will help you contain the mess and make the cleanup process much more efficient. This small container can be easily placed on a driveway or in the garage. The 6-yard dumpster goes where others cannot and allows you to easily and quickly throw away items you don’t need right in the middle of a project. Unlike large containers, this dumpster features wheels that can be taken off to remain stationary or left on so that the dumpster can be pushed back and forth. Once you have it in the right spot, you can lock the wheels in place. The best part is that these wheels have been specially designed so that they don’t scratch or mark surfaces such as your driveway or garage floor. This is the only roll-able dumpster available in OKC. You can also keep strangers from dumping trash in your dumpster by easily keeping it in the garage! The 6-yard dumpster is perfect for a variety of projects and can serve the needs of projects in residential homes or small to medium sized businesses. When you’re moving or cleaning out a small space and need to get rid of unnecessary junk, this container can be conveniently placed to get the job done faster. It conveniently has special wheels that won’t markup surfaces so you can push it back and forth as needed. Some projects in the home or the office, such as light remodeling or landscaping, can create waste that simply won’t fit in the normal trash bin. This dumpster can give you the extra trash space you need to keep your space clean and tidy. Since you can keep this dumpster in an enclosed space, like a garage, people won’t be able to put trash in your dumpster illegally! At Junk Boss we provide the best customer service in Oklahoma City. Our containers are properly cleaned and well maintained between every job so you always have a clean container at your job site or home – and not an ugly eyesore. When we drop off the container we can send you a picture via email or text to make sure it’s in the right location. You also have the option to text us when you’re ready for the dumpster to be picked up and our team is always timely. 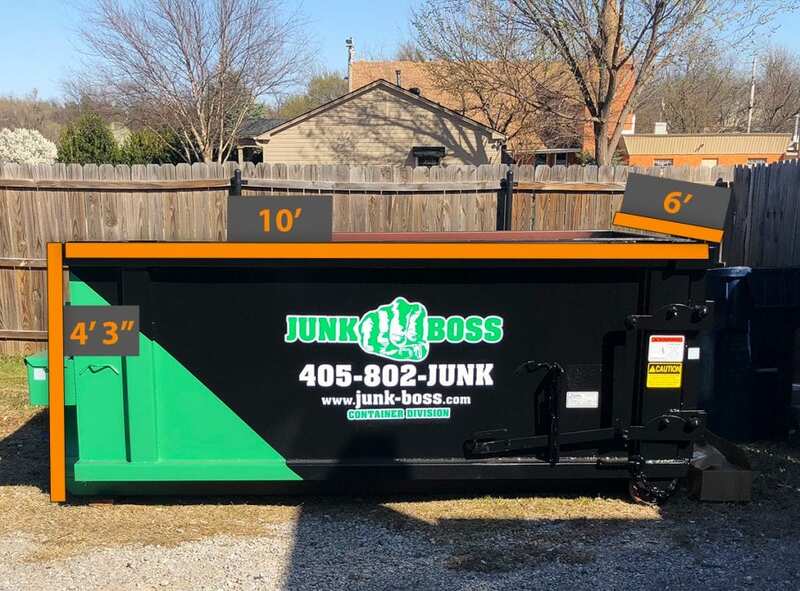 Call Junk Boss today to get the perfect sized dumpster for your next project!